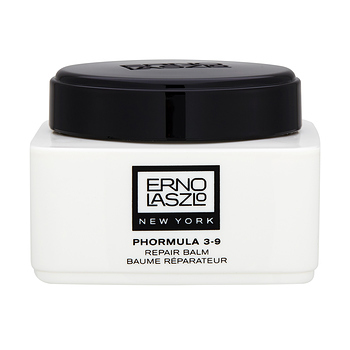 ERNO LASZLO Phormula 3-9 Repair Balm has the following features: The iconic nourishing balm creates a protective Health Dome™ that strengthens skin by its rich formulation of Emu Oil, Tamanu Oil, Glycosaminoglycans and Palmitoyl Pentapeptide. Beneath this optimal protective layer, the skin effectively absorbs the formula’s smoothing and intense hydrating properties. This intensive nourishing balm revitalizes stressed skin caused by dry patches, sunburns, post-surgical scars and damages from medical beauty treatments.